Jeff Sutton’s buildings are everywhere and his portfolio may be worthy $1 billion, but you’d never know it. The question is a telling one for someone who has in the last two decades built up a portfolio, mostly of New York City retail properties, that may be worth upward of $1 billion. 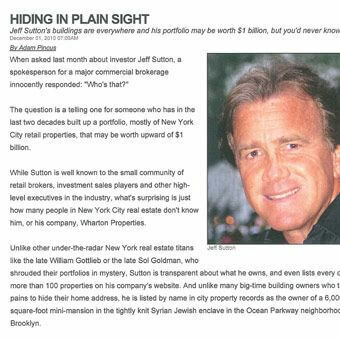 While Sutton is well known to the small community of retail brokers, investment sales players and other high-level executives in the industry, what’s surprising is just how many people in New York City real estate don’t know him, or his company, Wharton Properties. Unlike other under-the-radar New York real estate titans like the late William Gottlieb or the late Sol Goldman, who shrouded their portfolios in mystery, Sutton is transparent about what he owns, and even lists every one of his more than 100 properties on his company’s website. And unlike many big-time building owners who take pains to hide their home address, he listed by name in city property records as the owner of a 6,000-square-foot mini-mansion in the tightly knit Syrian Jewish enclave in the Ocean Parkway neighborhood of Brooklyn. Yet Sutton is almost never quoted in the real estate-obsessed press-even as he actively buys, sells, and builds properties. “He doesn’t need it. I don’t think Jeff wants to be in the limelight. I think he likes being under the radar.” Said retail broker Michael Freidman, the president of In Line Realty, who first met Sutton, now in his late 40s or early 50s, about 15 years ago, when Friedman was a broker representing shoe retailer Payless in the outer boroughs. “The guy has street credit.” Sutton is everywhere, but nowhere: He was aware of this profile, but he declined to be photographed or quoted. Still, his properties speak for themselves. They are an impressive mix of less-than-glamorous retail sites in the outer boroughs-including many concentrated on major shopping drags—and trophy assets like the American Eagle Outfitters flagship store at 1551 Broadway in Times Square, the Armani store at 717 Fifth Avenue, and the American Girl Place building at 609 Fifth Avenue. A count of the 100-plus listings on his website show that 66 are mostly retail buildings on popular outer-borough strips like Roosevelt Avenue in Queens, Fordham Road in the Bronx and Fulton Street in Brooklyn. Although his first high-profile deals were struck years ago, Sutton remained active even during the downturn, inking deals such as the $200 million lease earlier this year with AEropostale at 1515 Broadway, and the $120 million lease in December 2009 with American Eagle Outfitters at 599 Broadway in Soho. He also teamed up earlier this year with longtime partner SL Green Realty to gain control of 11 West 34th Street. And he currently has two prominent new construction developments in the works in Manhattan. In Harlem, he’s partnering with NFL player turned real estate developer Emmit Smith on a high-profile, 200 room Hyatt Hotel project on 125th Street and Lenox Avenue. Sutton is building the three-story retail portion at the base of the tower, where sources say Whole Foods may sign on as an anchor tenant. Meanwhile, he’s also working with SL Green on 180-182 Broadway, a new, 23-story Kart Fischer-designed building with 7,500 square feet of retail on the ground floor, second floor and basement. Sources said Sutton also signed a deal with House of Hoops this year for about $600 per square foot at 11 West 34th Street, which would be the highest rent on a block where he is a dominant retail presence.